Barbie and Ken are the ‘It’ couple that has rocked the world since they first got together in 1961. Their roller coaster of a relationship have fans loyally following their story to this day. Even if Barbie and Ken had made many major changes throughout the years, they are still some of the most beloved toys (and certainly Hall of Famers now) in the world. Barbie’s bubbly and curious personality is very well translated in the third Toy Story film. They decided to give Ken a very interesting albeit ‘out of character’ personality. Nonetheless, Barbie and Ken still found each other in this universe so everything’s fine. 1 Turquoise Unitard Barbie prefers the comfortable turquoise unitard that can be used for working out. 2 Thick Hot Pink Belt Barbie provides balance to her outfit by wearing a thick, hot pink belt around her waist. 3 Rainbow Leg Warmers Barbie adds more personality to her outfit by wearing a pair of rainbow leg warmers. 4 Blonde Wig If you don’t have Barbie’s signature blonde look, you should wear a wig and put it up in a high ponytail. 5 Hot Pink Scrunchie Don’t forget to use a hot pink scrunchie for your ponytail! 6 Hot Pink Closed-Toe Heels Instead of comfy sneakers, Barbie prefers a stylish pair of hot pink heels. 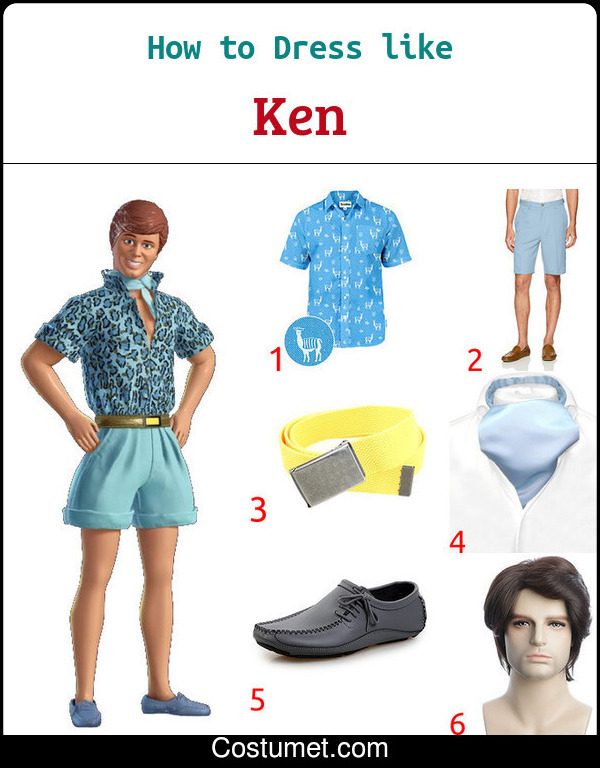 1 Light Blue Patterned Button Down Shirt Ken is primarily a girl’s toy, and his fashion is as on-point. Take his light blue patterned button down as an example. 2 Light Blue Chino Shorts Ken prefers light blue chino shorts with the bottoms rolled up ever so slightly. 3 Yellow Belt Ken adds a chic touch with his white belt around his waist. 4 Light Blue Ascot Ken loves to make outfits look interesting, and his light blue ascot certainly does that. 5 Light Gray Loafers Ken matches his light outfit with a casual but trendy pair of light gray loafers. 6 Brunette Wig You can get Ken’s sleek hairstyle by wearing a wig. 1 Large White Display Board Use at least 2 display boards to create the base of your doll box. Make sure you fit comfortably inside and that one part is open about three-fourths of the way. 2 Pink Acrylic Paint Use the pink acrylic paint to make your doll box resemble a real Barbie box. 3 White Acrylic Paint Use your white acrylic paint to put in the details like the brand name and etcetera. 4 Hot Glue Gun and Glue Sticks Instead of tape, you can opt for a hot glue gun and glue sticks to paste your boards together. 5 Nylon Straps You might also want to put in straps to help keep your box secure. Mattel’s popular doll, Barbie, was voiced by Jodi Benson for her role in Toy Story 3. Benson is also known as the voice of Ariel from Disney’s The Little Mermaid. Her doll boyfriend, Ken, was voiced by veteran actor Michael Keaton. Keaton is known for his role as Beetlejuice in the film of the same name. For this costume set, Carl and Ellie are wearing their childhood outfits. Ellie has on a floral blouse and denim overalls while Carl prefers a white shirt under a brown vest and cute khaki shorts.